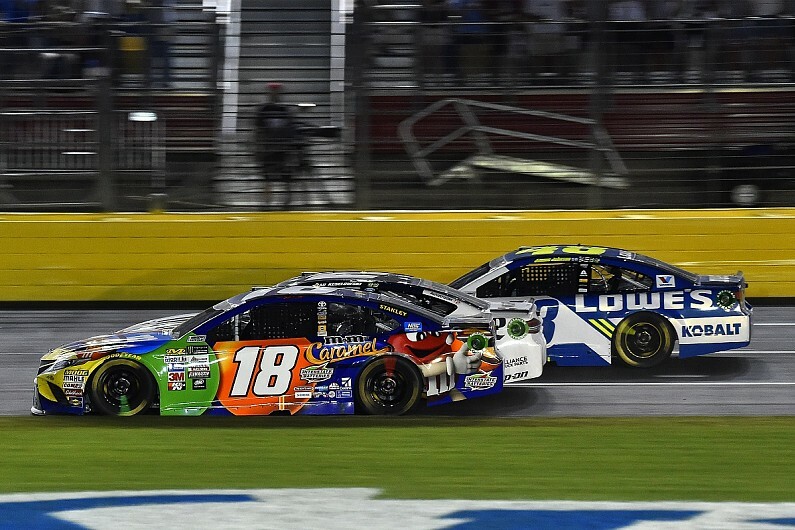 The NASCAR Cup series believes that the Charlotte All-Star race is the “perfect opportunity” to trial a radically different format for the 2018 race. NASCAR confirmed it will trial a new aero package that was debuted in the feeder Xfinity series last year at Indianapolis. It means that each Cup car will be fitted with aero ducts, a revised spoiler, a restrictor-plate and a 2014-style splitter. A record number of lead changes and leaders were registered in the Xfinity race last year. The All-Star Race has previously been a trial for NASCAR innovations such as racing under lights and the stage format. “NASCAR is committed to innovation and will always work to improve the racing product for every series and venue,” said Steve O’Donnell, NASCAR executive vice president and chief racing development officer. “The positive feedback following last year’s Xfinity Series race at Indianapolis gave us the foundation to implement this dynamic package for the All-Star race. The format for the non-points paying All-Star race will include four stages, with the first totalling 30 laps, the second and third taking 20 each and a 10-lap finale. Competition cautions following the end of each stage will remain in place, but NASCAR overtime rules – mandating a winner is declared under green flag conditions – will apply to all stages and there will be no mandatory pit strategies. “The All-Star Race has a long history of edginess and innovation,” said Marcus Smith, president and CEO of Speedway Motorsports, Inc.
“We want to challenge drivers, spark on-track action and create the best show for the fans. “This race has always been a proving ground for some of the best innovations in our sport, from running under the lights to stage racing and double-file restarts. While the All-Star race has often been a precursor to NASCAR rule changes, the series previously admitted that the aero ducts proved difficult to adapt to the current Cup cars – although the Xfinity series will use them again at Pocono and Michigan this year. The field for the race is set by multiple qualifications, including race winners from 2017 and ’18, former All-Star winners and Cup champions competing full-time.